Cause of YOU...my job is ova there! While trade rumors in the NBA are more prolific than Pamela with a mid-major Rockstar, the difference with the Kobe rumors was the entire roster was in the tabloids. In addition, instead of the rumors happening 25-games in when players are already dialed-in and in their routine, the Bulls were dealing with the drama during off-season work-outs and preseason practice. And more than most teams, Paxson, Skiles, & Co.’s overachieving gym-rats thrive on summer practice and probably struggled with the unforeseen coverage in ESPN chat-rooms. While the “Kobe…Kobe!” cat-call fanatics will tell you Paxson had to listen and was trying to bring a championship, I’ll tell you that he fell for the bait because Lakerland was never gonna trade Mr. Bryant. The Lakers asked for more than teams could afford, and if a team actually was willing to pull the trigger, Kobe would have baulked cause he’d have no one to play with. I don’t blame Paxson for trying, but I blame him for running everybody’s name through the mud when it probably was never going to happen. I’ll be honest. I’ve been a diehard Skiles supporter even more than I was for Saved By the Bell – The College Years. The problem…Zach Morris changed his haircut and Scott Skiles’s changed his humor to sarcasm. In Skiles’s defense, JV High School coaches can ride their players twice as hard as NBA coaches, and for all the talk that he runs his players ragged and is a perfectionist, I think he’s learned from past experiences and become much more of a player’s coach. And for all the talk that coach with his style is in one ear and out the other by year 3 or 4, I think the players believe in his system and understand that his sets can maximize their ability. The one problem I do see, is in his casual daggers thrown through the media. Myself personally, I love his truthful jabs, but question his back-tracking and explanations the next day. If he’s going to “call-out” Noah for taking a leadership role with the media or tell the beat writers T-Time is not what you call an end-to-end thoroughbred…stick to it. If he’s going to casually throw a player under the bus, I just wish he didn’t back-up the bus and apologize. For Coach Skiles to be successful, he needs to trust his gut and not worry that Jason Kidd problems from the past will haunt him in the future. Players take notice of his comments, and they also take notice when he tries too hard to make them fell better the next day. True! It doesn’t take a rocket-scientist to figure out the Bulls don’t have a post threat and nobody can take the ball to the hole whenever they want. Teams know the Bulls are attacking and looking to kick-it out. Flip Saunders knows Ben Gordon needs space to launch, and most importantly, teams know Kirk Hinrich will dribble around for no reason. I love the Bulls motion-offense, but I’d also love to see them do something I don’t expect. The Bulls are predictable and that needs to change. Maybe a trade is the answer, or maybe it’s time for one of our overachievers to become a star. Anybody who doesn’t think Deng & Gordon’s decision to pass on guaranteed money hasn’t added pressure to their game is more foolish than those who think Devin Hester can be more than a special teams star. The truth of the matter in this issue, if Deng & Gordon are worth more than they turned down…we can become an Eastern Conference Champ. If they can’t, then maybe Paxson should have made the blockbuster trade. It would be a great day in Chicago if the Bulls were forced to pay those guys the money they want…because that means they were better than I thought. Of course I skipped the Benny the Bull issue, but if that’s the problem, then the marketing group needs to contact Jack Haley. The Bulls problems are legit and anybody who sugar-coats it is satisfied with being a good, and not great in the East. Ben Gordon’s not getting taller, Kirk Hinrich is never going to average more than 8 assists per contest, Luol Deng is not a go-to guy when you need someone to get to the line with the game on the line, and no matter what Paxson says, Ben Wallace is a bust for the money they’re paying him. What I don’t know is if they have something deep-down that will make me eat my words. 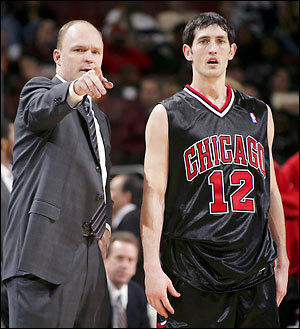 And trust me…I’d love to eat that sandwich and I’ll buy Paxson, Skiles, & Co. one too. ...on finally, onto my picks! While Santa brings some luv...so does Brandon Roy! This page contains a single article from December 25, 2007 10:17 AM.